Branson has plenty of lakeside restaurants that can give you a relaxing dining experience and some of the best Ozark cuisines. Known for its pristine lakes with crystal clear waters, Branson is where local and tourists alike would love to spend their summer escapade. In Branson, you will find some of the best lakeside restaurants that include Chateau Grille at Chateau on the Lake Resort & Spa; Resort and General Store Restaurant; Charlie’s Steak, Ribs and Ale on Table Rock Lake; and White River Fish House on Lake Taneycomo. The Chateau Grille restaurant at the Chateau on the Lake Resort & Spa offers gourmet cuisines to poolside snacks and always something delicious to satisfy your appetite. The scenic location of this lakeside restaurant overlooking Table Rock Lake provides you an unparalleled dining experience in the Ozarks. This award-winning restaurant offers relaxing ambiance and spectacular views not found in other restaurants. At Chateau Grille, you will get to enjoy incredible sunsets over Table Rock Lake from the elegant dining room. From delicately prepared Chilean sea bass to tender filet mignon, the award-winning menu of Chateau Grille is sure to impress even the most choosy diner. The family friendly restaurant Resort and General Store on Table Rock Lake offers pizza, burgers, sandwiches, awesome frozen custard, delicious shakes, top of the line premium hard ice cream, 25 flavors of shaved ice, Bavarian roasted nuts, ice cold soft drinks, real Keg Root Beer and much more. This is the lakeside restaurant in Branson where you can taste Table Rock Turtle or Brownie Bombshell specialty sundae or you choose their mouth watering sundaes, or fabulous root beer floats. Aside from a relaxing indoor seating that you will enjoy, the restaurant has an outdoor patio where you can enjoy outdoor lakefront seating. 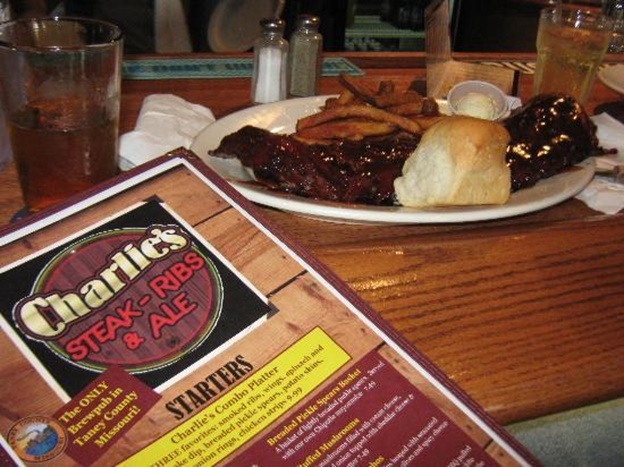 Charlie’s Steak, Ribs and Ale is another lakeside restaurant in Branson that you can visit by boat or car. This dining place is a full service family restaurant that offers live entertainment show on weekend nights and stunning lake view. While the location of this lakeside restaurant on Rock Lane Resort and Marina is just a few minutes away from Branson Strip, the secluded location of this fascinating place will make you feel that you are far away from the city. Rock Lane provides guests an up-close and personal view of picturesque Table Rock Lake. White River Fish House in Branson is a floating restaurant that offers a unique lakeside dining experience on the banks of Lake Taneycomo. The restaurant offers both indoor and outdoor dining seating. With its spacious 6,800 square feet, the restaurant can accommodate up to 225 guests. Smaller groups can be accommodated as well in two meeting rooms that can seat up to 10 people. The restaurant has an additional outdoor dining space of 4,000 square feet which is available in warmer months of the year. Branson is a unique vacation spot in the Ozarks where you can see plenty of lakeside restaurants that offer relaxing dining experience.